I’m not supposed to be writing this. I’m supposed to be packing for that ski trip I told you about. But I couldn’t resist telling you about a few good things that have come my way lately. 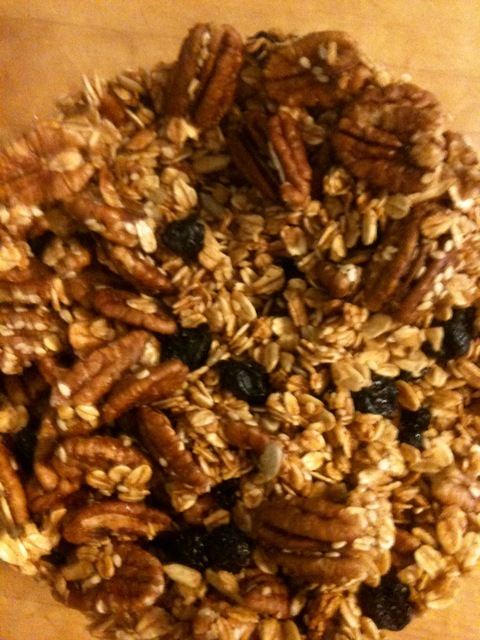 This is the granola I made this morning, inspired by the wonderful blog Orangette. My horoscope for today recommended that I “make something with honey” (in 40-odd years of reading my horoscope in the morning paper, I have never been similarly advised) so maybe it was in the stars, but it took Molly Wizenberg extolling the virtues of homemade granola and providing me with a few great recipes to convert me. The house smelled great. Do yourself a favor — read Orangette. And make your own granola (I haven’t yet tried the recipe you’ll find by clicking on the above link. I used an earlier Orangette granola recipe, which Molly adapted from Nigella Lawson. You can find it in the Orangette recipe index). (I also made my own pancake mix, but we haven’t tasted it yet, so I’m not ready to share the recipe. I snuck in flax seeds. Shhhh. Don’t tell Jeff and the girls). While I was making the granola, I listened to a few stories from The Moth, the live storytelling project based in New York. I learned about The Moth last week, when I was asked to participate in a Spoken Word performance on March 20, as part of the Ballard Writers Collective. The stories I heard today were funny and touching. I’m looking forward hearing more from The Moth during our eight hour road trip. (I’ll tell you more about the March 20 event later). As you know, I’m interested in eldercare and in spreading the word anytime I hear of anything that makes life easier for the elderly and their caregivers. This recent post from The New Old Age is just such a thing. At a networking event this week, I met an eldercare advisor and was reminded of this growing business. If you are caring for someone and feel overwhelmed, you can hire a consultant to help you navigate Medicare, find senior housing, etc. Also, Jane Gross told me to tell you about her Facebook page, where she provides useful updates and information for fans of A Bittersweet Season: Caring for Our Aging Parents and Ourselves. 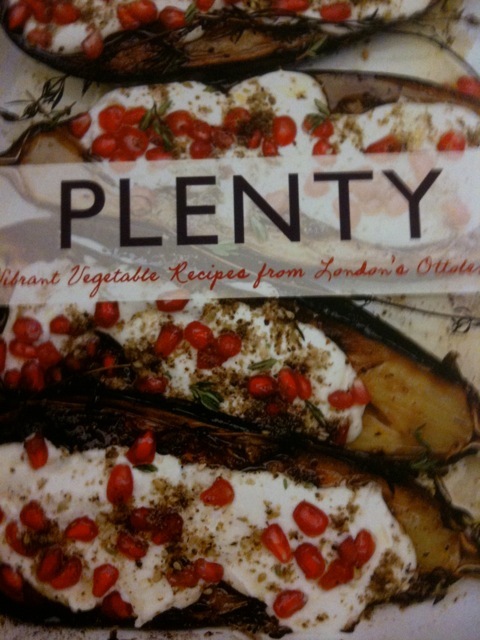 Yesterday, at Costco, I found this fantastic Near East-inspired vegetarian cookbook. I’ve read about Yotam Ottolenghi and Plenty in my cooking magazines and in The Guardian, and have even made some of his recipes, but I was unprepared for how blown away I have been by this book. I want to cook and eat everything in it. Tonight. Instead of packing. Finally, it’s no secret that there are a few places I would rather be going than skiing. But, to paraphrase Adele in her beautiful cover of this Bob Dylan song (you can buy the live version on iTunes), I’d go to the ends of the earth for the ones I love (though eight hours in the car with a teen and pre-teen might be pushing it). That’s all, folks. I’ll be diligently doing my physical therapy exercises and writing next week, and maybe even doing a little bit of skiiing too.